on November 21, 2018, 6:55 p.m. The carrier heads the list with a score of 80.9. The top three is followed by South Korean electronics conglomerate Samsung (80.3) and Japanes retailer Uniqlo (77.7). Personal care brands make up a large chunk of the list. 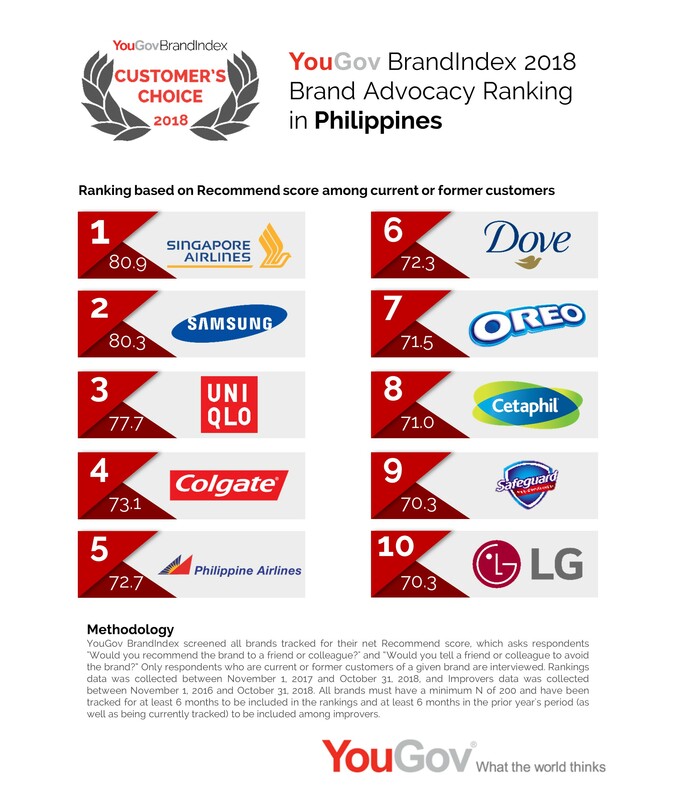 Oral hygeine brand Colgate comes in fourth (73.1), Dove in sixth (72.3), skincare brand Cetaphil in eighth (71.0) and soap brand Safeguard in ninth (70.3). The top ten is rounded off by national airlines Phillippine Airlines in fifth (72.7) and South Korean electronics manufacturer LG (70.3). YouGov also shows which brands have the most improved level of customer advocacy. Rizal Commerical Banking Corporation (RCBC) comes out on top (an increase of +10.1 points). It features ahead of local fashion retailer Penshoppe (up +9.6 points), and local bank Asia United Bank (AUB) (up +9.0 points).